When the Oklahoma Supreme Court on June 4, 2013 struck down the Comprehensive Lawsuit Reform Act of 2009, it reversed one of the most far-reaching measures governing litigation in Oklahoma lawmaking history. For more than 3 ½ years, attorneys working in almost every area of civil practice studied and embraced the new 2009 Act as prevailing law. By June, 2013, it had become the new norm. The court’s 2013 reversal now rolls back the clock with regard to numerous legal procedures codified in the 2009 Act, including measures that affect service of summonses, pleading requirements and discovery disclosures. Another opinion handed down the same day for the second time reversed an approach to tort reform that violated a constitutional prohibition against special laws in Oklahoma. Complicating the impact of the courts June 4 action, the opinion does not include references to the specific sections of law now rendered void. Without those references, an automated annotation system at the state court Web site (www.oscn.net) can’t include a reference to the court’s opinion in the annotations for each of 81 sections in 10 titles of Oklahoma law altered by the decision. full text (and links) to the two sections of Oklahoma’s constitution cited in two June 4 opinions that reversed the 2009 Tort Reform law. links to full text of the House Bill 1603 – The Comprehensive Lawsuit Reform Act of 2009 – which was ruled unconstitutional by the 2013 court. links to other attorneys’ earlier analysis of the Comprehensive Lawsuit Reform Act of 2009 and analysis of the history and case law associated with single-subject requirements. The impact of the reversal, however, is mitigated in part by new law passed since the now-defunct 2009 Act. Those statutes remain enforceable, though they may be subject to other challenges. A $350,000 damage cap was separately codified in 2011. Some trial attorneys argue the damage cap remains vulnerable to separation of powers challenges. Another 2011 Act eliminated joint and several liability, including exceptions provided in the 2009 Act. The impact of court’s ruling may be moot in regard to other sections of the 2009 Act in so far as it codified accepted case-law precedent and common law. The 2009 Act required courts to decline jurisdiction in actions more properly heard in another court or another state. That was already at least in part a common law principle adopted by state court precedent. “The Oklahoma Supreme Court first approved the doctrine of forum non conveniens in St. Louis-San Francisco Railway Co. v. Superior Court, Creek County, 1955 OK 111, 290 P.2d 188,” an Oklahoma appeals court determined in Lovett v. Wal-Mart Stores, Inc., 2001 OK CIV APP 9. That court noted their 2001 opinion left forum non conveniens decision to the discretion of the trial court, subject to appellate review. The June 4, 2013 opinion in Douglas v. Cox Retirement Properties, Inc. 2013 OK 37 that struck down the 2009 Act as unconstitutional was one of two Supreme Court decisions rendered that day that affected the tort reform act. In a separate decision, the court struck down a provision of the 2009 Act that had required anyone filing a suit alleging professional negligence to submit an affidavit of merit, signed by a qualified professional. The court struck that provision as a violation of Oklahoma’s constitutional provision against special laws. The constitution defines 28 subjects in which the legislature cannot pass laws that don’t apply to everyone. The court cited the same reasoning in 2006 when it struck a similar measure that attempted to require those who file medical malpractice lawsuits to include an affidavit of merit. The legislature in 2009 expanded the requirement to include all lawsuits involving professional negligence, but the expanded scope fell withing Oklahoma’s provision against special laws all the same, the court concluded in the June 4, 2013 Wall v. Marouk 2013 OK 36 opinion. The court further ruled that the cost of obtaining affidavits created an undue financial burden for those seeking access to the courts. 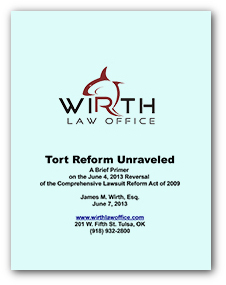 The constitutional provision that thwarted the 2009 tort reform is similar to those in most states that attempt to prevent “logrolling” – the legislative practice of including dissimilar measures in one bill to garner votes for otherwise less popular initiatives. Experts say Oklahoma’s single subject rule has survived court tests to stand among the strongest such rules nationwide. The U.S. Congress represents one end of the spectrum, where little if any controls prevent the inclusion of unrelated topics in bills for purely political purposes. While courts in some states have vacillated on their interpretation of their state’s single subject rule, “Oklahoma courts have been more consistent in their single subject decisions,” attorneys Stanly Kaminski and Elinor Hart wrote in a February, 2012, article for The United States Law Week. Article 5 Section 46 . Local and special laws on certain subjects prohibited. Every act of the Legislature shall embrace but one subject, which shall be clearly expressed in its title, except general appropriation bills, general revenue bills, and bills adopting a code, digest, or revision of statutes; and no law shall be revived, amended, or the provisions thereof extended or conferred, by reference to its title only; but so much thereof as is revived, amended, extended, or conferred shall be re-enacted and published at length: Provided, That if any subject be embraced in any act contrary to the provisions of this section, such act shall be void only as to so much of the law as may not be expressed in the title thereof.